* Name: Alaa Mohammed Abdul Hussein Abdul Rasool Al-Kashwan. * Place and date of birth: Karbala, Iraq, 1956. * Current address: University of Baghdad. * Specific specialty: pharmaceutics – industrial pharmacy. * Date of appointment at University: 8/5/1980. * Academic achievement: BSC in pharmacy/University of Baghdad, 1978. PhD in pharmaceuticals – pharmaceutical industry/University of Kentucky, United States, 1986. * A pharmacist: College of pharmacy/University of Baghdad, 1980. * Teacher Dr.: College of Pharmacy/University of Baghdad, 1986. * Rapporteur of the department of pharmaceutics/ College of Pharmacy/University of Baghdad (1986-1990). * Rapporteur of College council: College of Pharmacy/University of Baghdad (1990-1995). * Head of the department of pharmaceutics: Faculty of pharmacy/ University of Baghdad (1995-2002). * Head of the department of pharmaceutics: Faculty of pharmacy/ University of Baghdad (2004-2005). * Dean of College of pharmacy: University of Baghdad (2005-2012). * Current job title: President of University of Baghdad (2012 yet). * Postgraduate supervision: (90) theses MA and PhD. * Publications: (60) papers in addition to others under publication in academic international and local journals. * Pharmaceutical documented studies: (50) diverse studies in the field of pharmacy and pharmaceutical industry. * Pharmaceutical research projects: (20) researches for the ministry of higher education/research and development department/pharmaceutical industry and bioequivalence. * Pharmaceutical industrial conferences and symposiums: (60) conferences in America, Switzerland, Sweden, China, Egypt, Oman, Syria and U.A.E. * Top Professor in 2000 at the college. * Top Professor in scientific competence care Act’s in pharmacy for three consecutive years since the issue of that Act (2000 – 2001 – 2002). * Rapporteur of the papers of the journal of the American Society of pharmaceutical sciences – technology of pharmaceutical science (America) and other scientific journals. * Head and member of discussion committees for more than (100) MA and PhD. * Acknowledgement and certificates: over (100) discretionary certificates and one letter of acknowledgement from the ministers of higher education/health/industry/University Presidents and deans. · Professor of postgraduate studies (PhD): 1986. · Rapporteur of the department of pharmaceutics: 1986-1990. · Rapporteur of the college’ council: 1990-1995. · Head of the department of pharmaceutics: 1995-2005. · Dean of the faculty of pharmacy: 2005-2012.
. Current position: Rector of University of Baghdad: from 2012 yet. · Teaching in the colleges of pharmacy on the local and global levels. · Supervise on (90) postgraduate student (PhD & MA) in various areas of pharmaceutical specialty. · Participate in more than (60) local and international conferences in different countries (United States, Switzerland, Sweden, China, Egypt, Oman, Syria, U.A.E., Etc.). · Publishing more than (60) researches in local and international journals. · Publishing (50) studies in pharmaceutical industries. · Publishing (20) researches in pharmaceutical areas – research and development department. · Chairman of the National Committee for the selection of drugs (Ministry of health). · Chairman of the National Commission for the selection of botanical medicine (Ministry of health). · Chairman of the committee of deans of pharmacy (Ministry of higher education and scientific research). · Chairman of the committee of medical diploma (Ministry of higher education and scientific research). 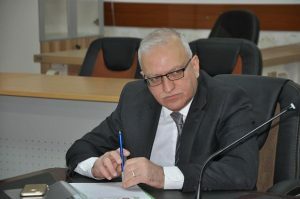 · Chairman of pharmaceutical consulting bureau (Faculty of pharmacy – University of Baghdad). · Editor in chief of the Iraqi Journal of pharmaceutical sciences. · Rapporteur of the American Journal of pharmaceutical sciences. · Founder and member of the Iraqi Board in clinical pharmacy. · Membership in more than (10) professional organizations and local and international scientific associations. · Top Professor at the faculty of pharmacy (2000). · Top Professor in scientific competence care Act’s in pharmacy for three consecutive years since the issue of that Act (2000 – 2001 – 2002). · Scientific award from the Iraqi pharmaceutical society. · Over (100) discretionary certificates and one letter of acknowledgement from the ministers of higher education, health, industry as well as university presidents and deans).